Until fairly recently our knowledge of stars and planets was pretty straightforward. Stars shone, emitting light by hydrogen fusion processes, and planets were dark objects orbiting them. This was simply common sense. No one spent too many sleepless nights worrying about what would happen when a object, undergoing the process of gas accretion to form a star or planet, would end up with mass somewhere in between. There is a critical size of about 80 Jupiter masses where such a body can sustain hydrogen fusion due to the temperatures and pressures generated by its own gravity (1). Then a star is born. The formation of planets is less well understood, and the emerging discoveries of extra-solar planets are challenging astro-physicists to revise their theories. Nevertheless, when a planet is forming, up to several Jupiter masses in size, then it remains simply that; a planet. As the mass increases, things start to get more complicated. Quite so. I should state here that Mark Marley is not endorsing my work in any way, and was just giving me a few helpful answers to my questions regarding brown dwarfs. His answer does include this invaluable statement that life could be possible on the moons of a brown dwarf, however. Brown dwarfs are very difficult to find. They "glow only faintly", emitting most of their radiation in the infra-red bands. This is because they are below the 0.08 solar-mass stellar limit, and fail to ignite as stars in their own right. Instead, they emit radiation from energy left over from their formation. During the life-span of a brown dwarf, the younger they are ,the brighter they appear. So we have more chance of discovering brown dwarfs that have just formed. As they get older, they start to appear more like Jupiter, only much more massive. In general, a brown dwarf’s luminosity is expected to be about a hundred thousandth of the Sun’s (4).Its spectral characteristics are different to those of very cool stars, unusually showing an absorption line of the short-lived element lithium. Contrary to the description implied by its name, brown dwarfs appear red, very red. A brown dwarf was discovered in the Solar vicinity by Maria Theresa Ruiz of the European Southern Observatory in 1997, a discovery that offers the potential for much better study of these elusive objects. She called it KELU-1, the term for ‘red’ in the language of the indigenous population of central Chile. The best known brown dwarf, and one that we can actually look at through an Earth-bound 60-inch telescope, is Gliese 229B, discovered in 1995. This one is in a binary system with the low-mass red dwarf Gliese 229A, at a distance of just 19 light-years from the Sun. The separation between the brown dwarf and its companion star is about the same as that between the Sun and Pluto. Its luminosity is about one tenth of the faintest star. Its spectrum has large amounts of methane and water vapour. Methane could not exist if the surface temperature were above 1500K. Astronomers consider its temperature to be about 900K (compared to Jupiter’s 130K), its mass to be between 20 and 55 Jupiters, and the age of the binary system to be between 1 and 5 billion years old. It has a smoggy haze layer deep in its atmosphere, essentially making it "much fainter in visible light than it would otherwise be". It is possible that ultra-violet light from its companion star changes its atmospheric properties from those of an isolated brown dwarf, such as KELU-1. 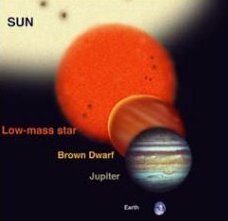 (1) The above image shows 3 brown dwarfs compared with Jupiter, the Sun and the red dwarf Gliese A (6). Note the much higher temperatures of these brown dwarfs compared to Jupiter. So brown dwarfs emit visible light, albeit faintly, but are cool enough to retain a planet like atmosphere! Stars and planets no longer appear to be entirely different entities. Imagine living on a moon of a brown dwarf : the dark star would be emitting red light and heat, yet it would appear like Jupiter regarding size and atmospheric consistency. Rather like Jupiter on fire, perhaps! Your moon would not only be warmed by the intense infra-red emitted from the brown dwarf, but also by its tidal effects (like Io and Europa are warmed by the otherwise cool Jupiter), and by its ambient red light. If your moon was terrestrial, in other words had aqueous oceans and a nitrogen-rich atmosphere, could not the emergence of life there be entirely possible? Mark Marley seems to think so. Without the dangerous ultra-violet radiation and cosmic rays emitted by the Sun, one could argue that this sort of environment is actually preferable to the environment on Earth! "A famous failed star known as a brown dwarf sent out a surprising X-ray flare, astounding scientists who were expecting nothing more than a few flickers, U.S. researchers said on Tuesday. The dwarf in question, known as LP 944-20, is one of the best known and most studied by astronomers because it is just 16 light-years from Earth. This is quite close in cosmic terms, but because brown dwarfs are so dim, it is visible from Earth -- with a telescope -- only as a tiny dot of light. However, scientists can learn about these dim objects by observing the X-rays they emit. This brown dwarf has a mass about 60 times the mass of Jupiter but only 6 percent of the Sun's mass, putting it under the threshold of mass that could make it a real star. Using NASA's orbiting Chandra X-Ray Observatory, astronomers watched LP 944-20 over a 12-hour period last December. For the first nine hours, they saw no X-rays, then detected a dramatic flare before it faded away over the next two hours. The flare was comparable to a small solar flare, but a billion times greater than X-ray flares detected emanating from Jupiter, the National Aeronautics and Space Administration said in a statement. Lars Bildsten of the University of California, Santa Barbara, said the flare is probably related to tangled magnetic fields beneath the surface of the brown dwarf, which seem to be able to generate X-rays. This evidence is in keeping with my proposals about the Dark Star Nibiru, and seems to swing the argument about brown dwarfs from the ‘planet’ identity towards the ‘star’ identity. 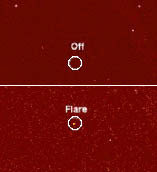 The passages in the Enuma Elish that describe Nibiru as having a ‘halo’, etc, fit well with this solar flare evidence. Brown dwarfs, although dim, are clearly emitting light to some degree. The astronomers say that they will return to this star-field for a closer look at these brown dwarfs. Given the unique stellar signature of these celestial entities, one wonders whether they may inadvertently stumble across a planet-sized brown dwarf that is to be found much, much closer than these distant specimens. For the very first time an object orbiting another star has been imaged, despite lying within the intense glare of the parent sun. The brown dwarf is 'more than 12 times the mass of all the planets in the solar system', and is orbiting the star 15Sge at a distance of 14 Astronomical Units, equivalent to an orbit that would lie between Saturn and Uranus in our own system. What is more exciting about this finding is the potential for this brown dwarf to be imaged more precisely over time. Does the coronal discharge emitted by this dark star interact with the Stellar Wind moving away from 15Sge? If the brown dwarf has an anomalous appearance, then we should be able to compare this with my theoretical model for the appearance of Nibiru while at a similar distance from the Sun. Scientific confirmation that planets might form around interstellar brown dwarfs, in a similar way to those that form around regular stars, emerged in 2001. Accretion discs were detected around these failed stars, some of which were as small as 10 Jupiter masses. This led to speculation that some free-floating brown dwarfs might harbour planets. Could some of them be life-supporting? Some scientists do seem to be waking up to the possibilities. But we can actually go much further than this. During the life of the solar system, stars and interstellar brown dwarfs would have passed through the solar system, as Jack Hills calculated in 1981 (11). One may well have been captured, by the mechanism Hills described in 1985 (12). Perhaps one that was long ago given the name 'Nibiru/Marduk'. A bit further down this page, we will read of the direct observation made in 2005 of a small Brown Dwarf's proto-planetary disc, offering compelling evidence that these failed stars come with their own planetary systems. Brown dwarfs have not been found orbiting 'standard' stars within 5AU distance, but astronomers have strangely imaged one of these celestial objects orbiting a low mass star called LHS 2397a. Current theories have it that brown dwarfs are likely to be wandering objects ejected from star systems early on in their development, but this discovery indicates that this may need some revision. Why one has been found orbiting a loss mass star when they are conspicuous by their absence around Sun-like stars is anyone's guess. But this unexpected development has given astronomers a unique opportunity to photograph the brown dwarf companion. For the low level of luminosity of LHS 2397a allows the feeble light of the brown dwarf to be separated, as this remarkable image shows. What is more exciting is that the separation of this brown dwarf from the low mass star is only 3AU. Comment that was passed on this discovery also provides some interesting reading. "We find companions to low-mass stars are typically only 4 AU from their primary stars, this is surprisingly close together," said team member Nick Siegler, a University of Arizona graduate student. "More massive binaries have typical separations closer to 30 AU, and many binaries are much wider than this." The new Gemini observations, Close said, "imply strongly that low-mass stars do not have companions that are far from their primaries." "Not massive enough to sustain the burning of hydrogen, like stars, brown dwarfs go through cooling stages that scientists observe with infrared energy-detecting telescopes. They appear as a faint glow, like an ember from a fire that gives off both heat and light energy as it dims. Astronomers expected brown dwarfs, like most objects in the universe, to grow steadily fainter as they cool. However, new observations showed that during a relatively short phase, brown dwarfs appear to get brighter as they cool. The explanation lies in the clouds. At least 25,000 times fainter than the sun, brown dwarfs are still incredibly hot, with temperatures as high as 3,140 degrees Fahrenheit (2,000 degrees Kelvin). At such high temperatures, substances such as iron and sand are in gaseous form. As brown dwarfs cool, these gases condense in the atmosphere into liquid droplets to form clouds, similar to water clouds on Earth. "As the brown dwarf cools further, atmospheric weather patterns cause a rapid clearing of the clouds; as the clouds are whisked away by the storms, bright infrared light from the hotter atmosphere beneath the clouds escapes, accounting for the unusual brightening of the brown dwarfs. I've often likened the appearance of Nibiru to a planet that smoulders like embers. Given the vivid description cited above, I appear to be justified in making this remark. 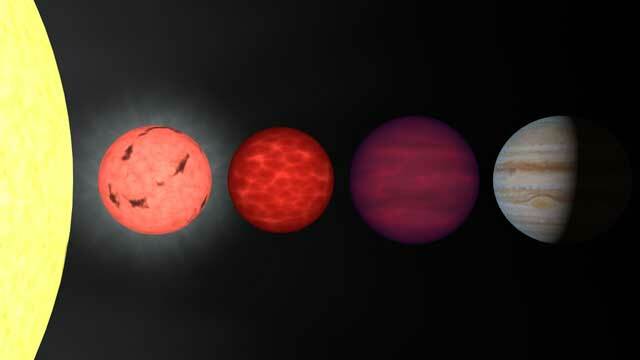 Even if Nibiru is very old, and therefore a cool example of a brown dwarf, I think this research is helpful. After all, if Nibiru enters the solar system during perihelion, the warming it will experience as a result could readily set off immense storms in its atmosphere, and the above model might allow us to predict how that could lead to an increase in Nibiru's emission of light and heat. The planet Nibiru at perihelion would appear like a re-lit ember, apparently as a result of its clearing cloud cover! If the Sun does indeed have a massive solar companion that'son the borderline between a massive planet and a small brown dwarf, then how would it appear to observers as it comes into the solar system at perihelion? The answer to that question depends very much on the age of the brown dwarf, but it is often stated that an old dwarf would be essentially extinguished. So if Nibiru, which is roughly the same age as the Sun (given that it entered the solar system only half a billion years after its creation and so probably came from the same stellar nursery), is a small brown dwarf it should be like Jupiter. So the argument goes. 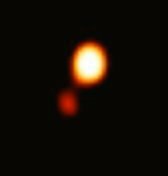 "A Chandra observation revealed X-rays produced by TWA 5B, a brown dwarf orbiting a young binary star system known as TWA 5A. 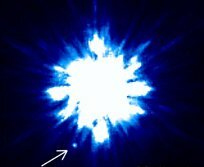 The star system is 180 light years from the Earth and a member of a group of about a dozen young stars in the constellation Hydra. The brown dwarf orbits the binary star system at a distance about 2.75 times that of Pluto's orbit around the Sun. 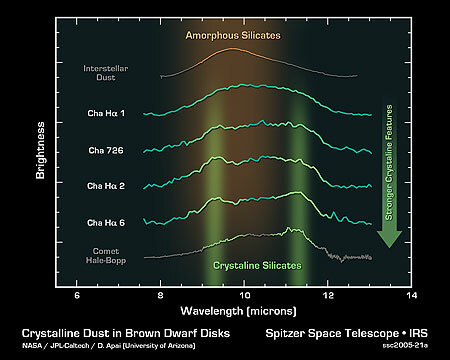 "Young brown dwarfs, like young stars, have turbulent interiors. When combined with rapid rotation, this turbulent motion can lead to a tangled magnetic field that can heat their upper atmospheres, or coronas, to a few million degrees Celsius. 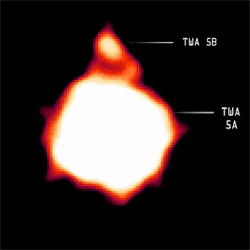 The X-rays from both TWA 5A and TWA 5B are from their hot coronas. The fact that the emission is from the hot corona of the brown dwarf is also very interesting, because the shape of the corona could be subject to the stellar wind of the main star. 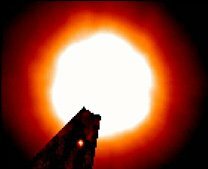 In Nibiru's case this could lead to a cometary tail of fire in the shape of a planetary magnetosphere swept back away from the Sun on its perihelion approach. Hence the Phoenix effect. Does the image from Chandra show such an effect? Unfortunately the resolution and overall glare is a major problem to answering such a question. But this information is encouraging nonetheless. For a little while I have been working closely with a researcher called Rajasun. Although he is not an academic astronomer, his long-term interest in the idea of our solar system being a 'binary' has propelled him headlong into the study of astrophysics. Recently, he wrote to one of the foremost experts on brown dwarfs, J.D. Kirkpatrick, and asked, amongst other things, whether an old, small brown dwarf was still capable of 'flaring'. It now seems that if, for instance, Nibiru was a small brown dwarf of a similar age to our Sun, then one might still expect flaring "because of the intense surface gravity which consequently affects magnetic activity on the brown dwarf" (Raja's words). Raja: "Is the incidence/frequency of X-ray flares directly related to Age and Teff of a BD [brown dwarf]? Is there a relationship between the reduction of X-ray flaring activity and increased radio flares on BDs (i.e. decreasing X-ray flaring leading to increase incidence of Radio flares)?" J. D. K. "That's precisely what we've been trying to determine, but the brown dwarf community hasn't received much time to investigate these issues using telescopes like Chandra and XMM. Keep in mind that part of our inability to answer this question comes from the fact that brown dwarfs, even when flaring, are pretty darned faint in X-rays. Chandra and XMM have been reluctant to give time for these projects because most brown dwarfs will be totally invisible at X-ray wavelengths unless you get lucky and happen to catch one during a flare." All of which seems to suggest that old brown dwarfs cannot simply be consigned to the dustbin of planethood. There is a growing flexibility built into these considerations that allows for planet-like old brown dwarfs with remnant stellar characteristics. This would readily fit the picture of a binary companion to our Sun that had so far evaded detection, but was yet capable of quite a few surprises. The chance discovery of a binary brown dwarf system has increased the potential for a similarly widely separate binary system for our Sun. 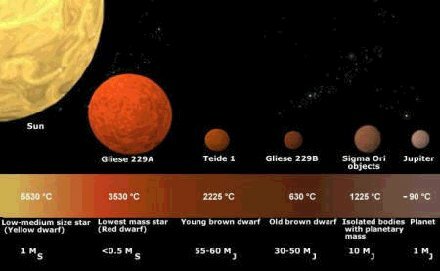 The two brown dwarfs are separated by about 240 AU, or 240 times the distance between the Sun and the Earth. This would relate to a semi-major axis distance for an orbit of 3500 years, similar to that envisioned for Nibiru. This is a very rare find, and breaks the mould for such binary systems, which tend to be separated distances that are a fraction of this. Astronomers are generally sceptical about finding planets at this distance, because they believe that the orbits would be easily subject to perturbation, and the binaries would break down. This discovery must bring this long-held belief into question. The discovery was made by Kevin Luhman, from Harvard University, Massachusetts. Seeking young brown dwarf for study he trained the Magellan telescopes at Chile's Las Campanas Observatory on a star cluster 540 light years away in the Chameleon constellation. He found a binary pair of brown dwarfs, and this discovery has subsequently re-opened the debate about how brown dwarfs form. "Calculations showed that the two brown dwarfs were orbiting each other at 240 times the distance between the Earth and Sun, a distance 10 times greater than other brown dwarfs pairs. Since even the slightest tug could upset this fragile balance, Luhman suggests the pair could not have formed from a violent ejection. Instead, they must have formed in a slow gravitational collapse, like stars. 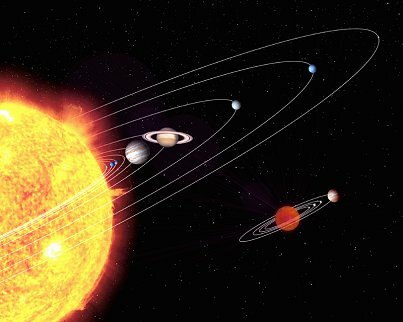 Other recent scientific findings suggest that the Sun did indeed once have a large body in orbit around it, larger than a Jovian planet. This discovery shows that a binary with a brown dwarf can form at this distance, and remain stable. Which would suggest that the presence of an ancient brown dwarf companion to the Sun need not have been lost over time. It may still be out there, and it may describe an orbit that is tantalisingly close to that of the mythical Nibiru. 'New Scientist' has reported on a remarkable discovery about the formation of a planetary system around a small Brown Dwarf. Because the glare of the Brown Dwarf is so much smaller than that of 'regular' stars it was possible to directly image material in a disc around it. Some of this material was clumping indicating planet formation. It is thought that the total mass of the proto-planetary system orbiting a Brown Dwarf would be equivalent to about 10% of the Dwarf's own mass. That provides enough material to form a Saturn-like planet, as well as a number of terrestrial worlds. Not only that, but discovering such worlds in these kinds of systems might actually be easier than looking for planets in more classical star systems, where the glare of the stare makes it very difficult to image much of anything in its immediate vicinity. Just recently a massive planet was imaged orbiting a brown dwarf (21). The scientific team, led by Kevin Luhman of the Harvard-Smithsonian Center for Astrophysics in Cambridge, Massachusetts, US, hopes to extend its search to even smaller brown dwarfs to see how small they can get yet still allow planetary formation. Not only does this research raise questions about how star and their planetary systems develop, but it also opens the door to more urgent speculation about the nature of a binary Brown Dwarf Companion in our own Solar System, should such an object be discovered in the future. The potential for life to have developed in such a system is increasing; at least, that is the verdict of science! As has already been mentioned on this page, brown dwarfs are massive planets that have accreted many times the amount of mass than Jupiter. Yet they remain approximately the same size. Instead, the weight is confined to an area roughly the size of Jupiter, and this makes them increasingly dense. This, in turn, makes their activity levels so much greater than mere gas giants like Jupiter as their surface gravity builds and builds with greater and greater mass. Although this general idea was accepted, it was still thought that the brown dwarfs would naturally increase in size as they moved towards a more typical dwarf star, like a red dwarf. However, scientists on the OGLE program have analyzed one particular binary brown dwarf, which is closely orbiting a Sun-like star towards the centre of the Milky Way, that is off the charts. They have discovered, to their surprise, that this binary companion shines like the Sun, yet is only 16% larger than Jupiter (22). This is amazing, because the binary companion is 50 times as massive as Jupiter, making it very dense indeed (23). Previously, brown dwarfs of this magnitude were imagined to be much larger objects. What is most surprising about this discovery is that this 'sub-stellar object' is simultaneously in the mass range of the brown dwarfs, shines like the Sun but is the size of a regular planet! How mixed up is that? Which, of course, goes to show that there are many, many possibilities to these brown dwarf objects. This has implications for the Dark Star Theory. Firstly, it increases the likelihood that a brown dwarf embedded in the Solar System would have developed as a star-like entity in its own right. It may have done this as a loosely bound binary companion to the Sun, within a fairly densely packed stellar nursery. This makes good sense anyway, because the chance of the Sun capturing an interstellar companion in the form of an ejected planet-like brown dwarf is quite remote. At least on a statistical level. This loosely bound binary companion's orbit may have altered over time, bringing it into close proximity to the Sun's planetary zone at some point (probably during the 'late, great bombardment' about 3.9 billion years ago). Hence, it played a part in shaping the Sun' planetary system, creating the various anomalies we find today. The jets of material ejected by young brown dwarfs also serve to indicate the remarkable activity levels of these objects, and the real potential for star-like qualities for even old-ish brown dwarfs, like the own potentially orbiting our star. I suspect they have generally been underestimated. Are brown dwarfs planets or stars, or a bit of both? They increasingly resemble stellar class objects, and this has been highlighted by the discovery of proto-planetary discs around several classic brown dwarfs in the Chamaeleon constellation. "The astronomers discovered that five of the six disks contain dust particles that have crystallized and are sticking together in what may be the early phases of planet assembling. They found relatively large grains and many small crystals of a mineral called olivine. The potential for the study of planets forming in brown dwarf star systems is huge. Firstly, it is thought that brown dwarfs are as numerous as traditional stars. Secondly, in the case of a brown dwarf system, the reflected light from candidate planets orbiting brown dwarfs would not be so overwhelmed by the brilliant light of the parent star. This would make it easier to differentiate smaller planets in this kind of dwarf system, and to analyse the composition of planetary atmospheres. Thirdly, undiscovered brown dwarfs may well lurk between here and the nearest stars, offering the potential for the discovery of closer planets than previously thought. 5) ESO press release 7/97 "A Faint and Lonely Brown Dwarf in the Solar Vicinity". 20) Hazel Muir, "Brown dwarf may someday harbour habitable planets" 8th February 2005, http://www.newscientist.com/article.ns?id=dn6977 with thanks to Peter Gersten, among several others! · "Dumping more mass on a brown dwarf doesn’t make it bigger, it just makes it denser. A 70-Jupiter-mass and 20-Jupiter-mass brown dwarf are both about the size of Jupiter. · From up close, a young brown dwarf would look like a low-mass star, but an old brown dwarf would look more like Jupiter. · Brown dwarfs aren’t brown, they would look red to the naked eye. · Brown dwarfs radiate most of their energy in infra-red light. · There’s a 50:50 chance that a brown dwarf lurks within 4 light-years, the distance to the sun’s nearest stellar neighbour. · Some brown dwarfs spin so fast that they complete one rotation in less than an hour. 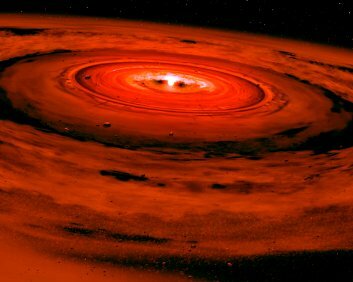 · Planets have rock-ice cores; brown dwarfs have hydrogen cores.